OK, so it's not Tom Hanks' finest film, but there is a scene in Joe Versus The Volcano that really captures the effect bad lighting has on people (no, really). 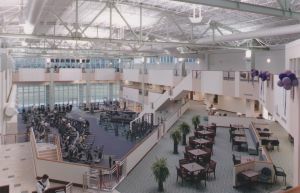 The inviting interior of the HealthPoint Fitness and Wellness Center in Waltham, Mass. Hanks, who plays Joe, works in an unbelievably drab, soul-sucking office in a factory, lit only by buzzing, flickering fluorescent lights. He brings in a desk lamp to provide warmer light, but his boss, Mr. Waturi, doesn't allow it, which eventually leads to a confrontation. "You look terrible, Mr. Waturi…not that anyone would look good under these zombie lights," Joe says. "I can feel them sucking the juice outta my eyeballs. The lights give me a headache. If the lights don't give you a headache, you must be dead." To put it more delicately, lighting affects people. Just spend some time in a poorly lit room, and you'll notice it immediately. 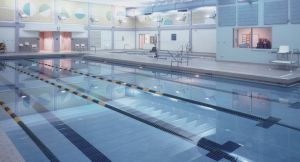 In recreation centers, the usual suspects include dark natatoriums, harshly lit locker rooms and dungeon-like fitness areas. Then there's sound. A massage room in your facility may have warmer lighting that a Barbara Walters interview, but if it's next to the bathroom, the relaxing mood will be repeatedly broken by the whoosh of toilets flushing. Poor lighting and sound insulation can make people uncomfortable quite easily. When you operate a health club, where people may already feel self-conscious, that discomfort can translate into lost revenue. Even worse, fixing these problems after the fact can be an expensive undertaking. "The overall operational professionalism has increased incredibly in terms of facility design and programs and services," says Bill Howland, director of research for the International Health, Racquet and Sportsclub Association. "With lighting and design elements, the current operators building facilities today pay attention to those details. When an experienced customer walks in a place that is not well lit, and the lighting's harsh, they notice it." If one facility doesn't have what they want, chances are there's another one nearby that will. Maybe that place down the street has nicely lit locker rooms. Maybe it isn't overwhelmed by the noise its aerobics studios generate during classes. As the person who handles research for IHRSA, Howland has talked to plenty of people to get their gripes. "A lot of the hesitancy to work out and join a club revolves around comfort and people's perception of their ability to perform," he says. "Anything that can be done to make clubs more inviting, more energizing, more welcoming, I think that helps." 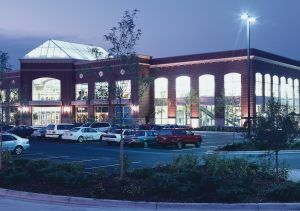 Life Time Fitness de-emphasizes its interior fluorescent lights by wrapping the building in windows and having a large atrium, which reaches to the middle of the building and provides a reference point so members don't get lost inside. Only in the past decade or so has lighting become much of an issue. Before, the reigning philosophy could pretty much be summed up by "It's bright, ain't it? What else do you want?" "Every element of club and recreation facility design has become increasingly more sophisticated," Howland says. "We're trying to engage more and more Americans in activity and exercise and encourage them to come into clubs. 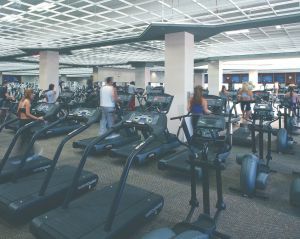 A big part of that is helping people feel comfortable in a fitness center or gym setting." The keys to lighting, Howland says, are function and efficiency. There's such a thing as over-designing, especially if those neat, welcoming lights are costly to use and/or replace—like gym or court lights, where each bulb can cost up to $30 to replace. "These facilities get used 358 days of the year," Howland says. "They open at 5 in the morning and close at 11, but the lights are still running as clean-up is being done at midnight. The amount of use systems get poses a challenge." At Life Time Fitness, that's not the only challenge. This spring, the health-club chain opened a more than 184,000-square-foot facility (a typical size for Life Time) in Tempe, Ariz., that's open 24 hours a day. Housed inside this giant box are 400 pieces of workout equipment, aerobics studios, saunas, steam rooms, three rock-climbing walls, two full-size basketball courts and an aquatics center. Lighting such a place is no easy task—especially considering the facilities keep getting bigger. Gyms have similar problems with echoes, but banners might not work there because balls often travel high in the air. Here, Lavoie recommends using acoustical steel decking for the roof structure during the construction phase. The benefits, he says, are huge and the investment small. If you have a facility that's already constructed, simple ceiling panels are easy to install and absorb sound well. All it takes is a quick calculation of how many you need for the square footage. "A lot of it you can plan for and design for, but until you get in there, and all the issues come out, sometimes it takes building the first one," Doerr says. "Acoustical modeling can help you with the planning, but the reality of the space often doesn't turn out as designed or planned for. Everything's kind of a work in progress." When asked about other design elements he likes to use in the facilities he builds, Lavoie mentions accent lighting to emphasize a bulletin board, a piece of art or a particularly striking architectural feature. 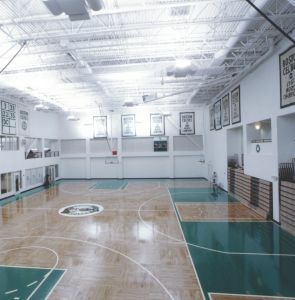 Designers used indirect lighting at the Boston Celtics Athletic Training Facility, a design choice not seen often in gymnasiums. Doerr mentions Life Time's new work on exterior lighting at night. There are lighting fixtures attached to the top parapet of the building with illuminated accent medallions. Lights on the ground shine up and wash the walls with a glow. "It's a combination of lighting angles, not just flooding the building with light, to accentuate the finer details of the building," he says. 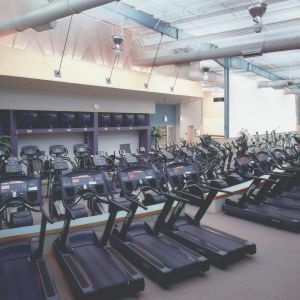 Hearing them, it's obvious that gone are the days of having a no-frills rec center, especially if you're a health club that wants to stay competitive. Howland says aesthetics will continue to be emphasized, if not more so, in the future. 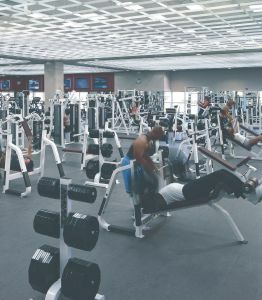 "If you visit facilities, they're just much more aesthetically interesting and appealing than gyms were just 10 years ago," Howland says. "That's what the experienced consumer comes to expect. It's a matter of keeping up with the Joneses. That brand-new gym down the street has brought in a professional to help them with their design and layout. I think it makes a difference." It's a fine line to walk, though, because just as overzealous attention to sound isolation can be costly, over-designing a facility can do that as well, and the customers end up footing the bill. "We try to keep the thing economic as well," Doerr says. "There's always more money that can be spent trying to come up with solutions, but we try to get more bang for buck, not driving price of membership up to the point that the model doesn't work." Going to such lengths to keep up with the Joneses doesn't guarantee customers, either. While consumers may expect more these days, your business will suffer if the basics are overlooked. "You may have state-of-the-art equipment on the floor, but to the average, inexperienced exerciser, they have no idea," Howland says. "But when they walk through the front door, they can tell if the club is well-lit and warm and friendly, and they can tell if the club is dirty or smelly. As an operator, which choice do you want to make?"